Bite-Sized: Donate | Wake up, Meeples! 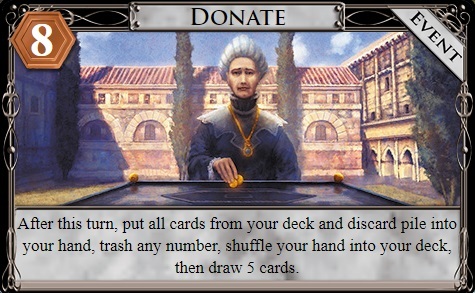 Donate is considered by many to be the most powerful card-shaped object in the game. Its effect is extremely powerful and its cost is entirely in debt, meaning you never have to hit a price point in order to access it. Donate is the fastest and the most precise trashing in Dominion, and completely changes the landscape of any game it appears in. Normally, junking attacks are centralizing to most games of Dominion, but with Donate, their effect is reduced from a potentially permanent negative force on their deck to a minor annoyance, causing them to have to Donate one or two extra times to clean up the mess. Normally you want to Donate once or sometimes twice between turns 1 and 5, but each of those turns should be planned out precisely and knowing the best thing to do can involve a lot of calculation.